The Carex Toilet Safety Frame bolts directly to the toilet and offers stability to those who have difficulty sitting down or getting up when using the toilet. The shortest width and height are 20 1/2 in w x 17 1/2 in d x 27 1/2 in h. The height adjusts from 27 1/2 in to 31 1/2 in by 1 inch increments and the width adjusts from 18 in to 20 in. Product weight is 3 lbs. 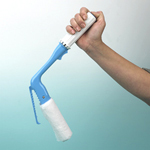 Handle covered with foam for comfortable grasp. 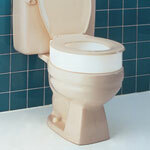 The weight capacity of this toilet safety frame is 300 lbs.